The best citrus are now in season and citrus based liqueurs are always part of my January project list. The first Cara Cara oranges translate to Triple Sec, an easy combination of sugar, fruit and clear alcohol (like vodka) that will make an amazing margarita in July, when it will be hot and we’ll be outside. Hard to believe in that sunshine when it’s all gray skies, but the smell of the citrus and the color of the liqueur are good reminders. Yes, triple sec, and I’ll make limoncello, arancello, and with those ruby red grapefruit that last week were part of a Salty Dog, this week become Vin de Pampelmousse, a heavenly digestif that requires hardly any work but plenty of patience. This is hardly a new idea. Food historians cite notations as far back as the fifteenth century for this French fortified wine. 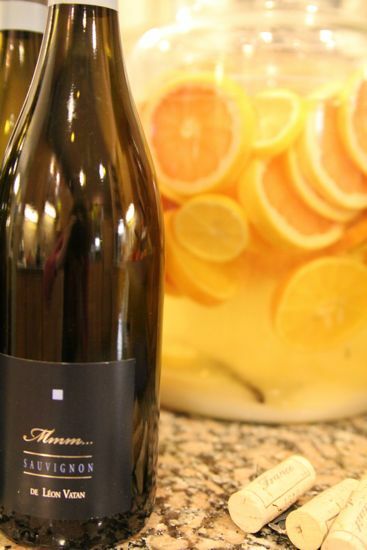 It’s not a grapefruit wine really, it’s a wine fortified with alcohol and flavored with citrus. The bittersweet, floral nuances are perfected when served ice cold in an elegant apertif glass, particularly after a heavy meal. The best fruit will be flavorful, juicy and deeply colored. The final product will be enriched by the color of the peel as well as the fruit, so pink and orange tones will keep the Vin from having a color akin to a certain familiar electrolyte drink. Select a good wine for this project. I prefer to use Sancerre, but it’s gotten wildly expensive, so this year, upon recommendation of the knowledgable fellows at Schneiders of Capitol Hill, I’ve selected a Loire valley sauvignon blanc. Evidently from grapes that live just on the other side of the proverbial track from the Sancerre grapes, and therefore much more affordable. In deference to this drink’s history, I always choose French wines for this project, but remembering the citrus is from California, I realize there is inconsistency in my logic. Even for apartment dwellers, this is an easy activity. You will need a two and half gallon glass jar, ceramic crock, or food safe plastic bucket that will fit into a dark corner of a closet or cabinet. I have even filled up oversized glass vases found at thrift shops. Eventually you will need eight empty glass bottles with caps or corks. As with many fortified wines and fruit liqueurs, fermentation takes a month or more, after which the solids are strained out. It may take three or four strainings for a perfectly clear wine. I prefer to strain twice, then decant and strain the wine into an elegant crystal pitcher at service. Always start with well washed, firm, ripe fruit, preferably organic. And get right on it, because citrus season is fleeting. 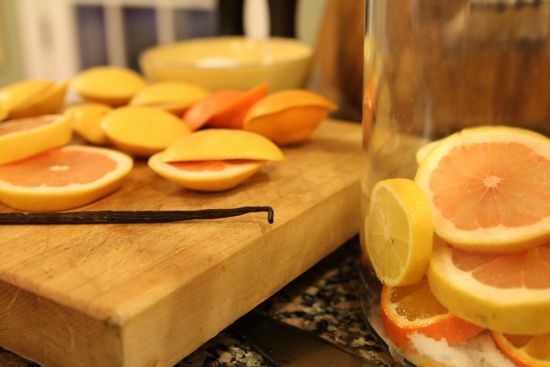 Wash the citrus well and then slice into 1/2” thick rounds. Remove the seeds as they will add an unpleasant bitterness to the end product. Pack the citrus into the jar sprinkling the sugar in between the layers. Split the vanilla bean and add it to the fruit and sugar. Pour the wine and vodka over the fruit. Stir well. Tuck the jar into the corner of a dark closet. For the first week, visit the jar every day and give it a good stir, to make sure the sugar fully dissolves. Make a note on the calendar to check on your project in forty days. After the jar has hung out in the closet for forty days, strain the fruit and vanilla bean out. Line the sieve with cheesecloth and strain the mixture two more times, then funnel your elixir into the reserved bottles. Allow the Vin de Pampelmousse to ripen another month before serving, during which time you can design appropriately divine labels for the bottles and think about who might be worthy of receiving one. I like it best after about three months. Store away from direct sunlight and heat. The finished Vin will keep indefinitely. Rinse and dry two one quart jars. With a vegetable peeler, remove the peel from 4 of the oranges, leaving behind as much of the white pith as possible. Divide the peel between the two jars. Juice all the oranges. You should have about 2 cups of orange juice. Heat the sugar and water until the sugar is dissolved. Pour in the orange juice slowly, stirring all the while. Bring to a simmer and cook gently for 5 minutes. Cool the sugar syrup completely. Then divide between the two jars. Divide the vodka between the two jars. Cover the jars and place in a cool, dark spot for one month. After one month, strain through cheesecloth and bottle. A friend offered me a ton of grapefruit – I’m going to have to take her up on the offer. What wonderful hostess gifts this would make. Some patience is required for this project, obviously, but it seems like it’s completely worth it. We’re overrun with citrus this time of year in Florida, and I’m pretty sure I can find a cool dark closet. Thanks for the idea! I’ve used Cathy’s recipe with satsuma oranges to great results. Simple and highly recommended! Yes, yes, yes!! Desperately seeking Seville oranges for my vin d’orange. Any suggestions? I sub Valencia for Seville, as Seville are never in my stores. I love the color and the sweetness of Caracara, but any orange will do. Love this post and will definitely have to try your recipe! Citrus anything is absolutely amazing! I really hope I can try this as I have access to fabulous citrus here. Really like your new preserves box! This sounds terrific! I’ve made many batches of limoncello but I always wanted to venture into other citrus + alcohol combinations. BTW- In the ‘Salty Dog’ post- you appeared to be using homemade gin. We’re intrigued and are wondering if you have a recipe for that. Also- Have you ever made Damson Gin? Saw it on an episode of Miss Marple and would love to make that- although I know plums aren’t in season. Thanks! Love this site! 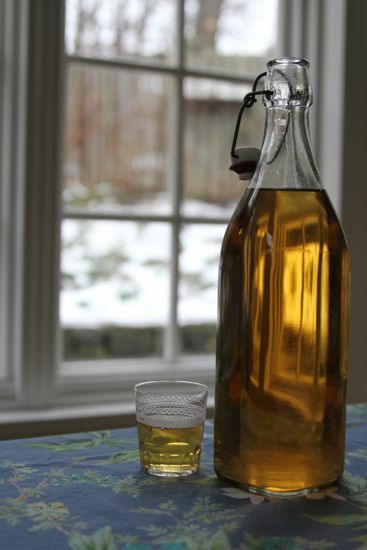 There is a link tonIan Knauer’s homemade gin recipe on the Salty Dog post. It’s brilliant! As to Damson Gin, that may be something like slivovitz, a recipe for which is also on this site. Just search under slivovitz! Cheers! Damson Gin is not like Sliebowitz which is more like plum schnapps. Damson Gin is closer to Sloe Gin. Thank you for this recipe! I’ve been searching around for others and most are very inspecific. I’m not going to make this. What I am going to do is come to Washington when a huge snowfall is predicted. I loved the vin d’orange I made last summer; this cara cara triple sec will soon be mine. ALL MINE. I don’t know that variety but if they are nice and sweet with a deeply scented peel, they will be great. Backyard trees overrun with Meyer Lemons and Mandarins….just bought 2 1.75 ltr bottles of “Boomerang Australian Vodka” at Trader Joes. Great Sunday afternoon project and Christmas 2012 is underway! Thanks! I thought I had preserved our citrus in every way possible this year. I guess I have to add liqueur to my list for next year! Hi Cathy! I’m getting ready to strain my vin de pampelmousse, but I noticed that there are some white spots on the slices of grapefruit that weren’t totally covered by the liquid—mold or something? You think the wine is still ok? I think next time I make sure all the fruit is totally submerged? Thanks! Read your “real” third Times piece. Very nice. Congrats. One question. 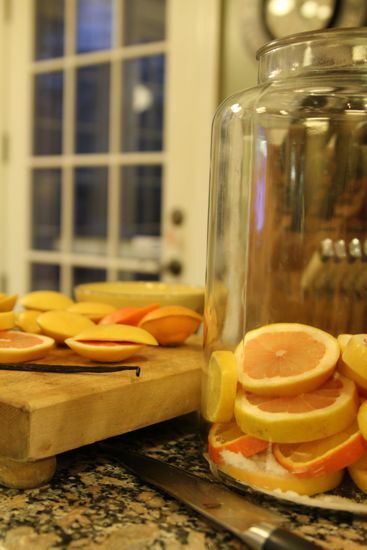 Do you use vodka as the basis for all these citrus infusions? I do use vodka. I tried Evercleer, and I thought it was a little rough. Even cheap vodka is smoother! Can I sub the cara cara oranges in the triple sec recipe for the satsuma I have growing in the backyard?